Stowe, VT – The first ski lift in Stowe, Vermont was a rope tow. Construction of the lift to transport skiers up Mount Mansfield was undertaken by the Mt. Mansfield Ski Club and Austrian Sepp Ruschp, and completed in December 1936, ascending from the base of what is now the resort’s Toll House area. The opening of that rope tow didn’t mark the beginning of skiing on Mount Mansfield. Skiing’s beginnings in Stowe actually occurred some four years earlier, when the Civilian Conservation Corps (CCC) cut the Bruce Trail, the first ski run on Vermont’s highest peak. The Mt. Mansfield Ski Patrol was founded a year later. 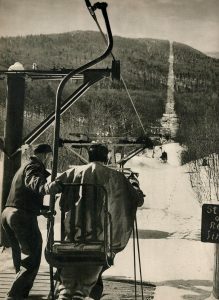 Stowe’s first chairlift, a single-seater, opened in November 1940. At 6,330 feet long with a vertical rise of 2,030 feet, it was billed at the time as the longest and highest chairlift in the world. 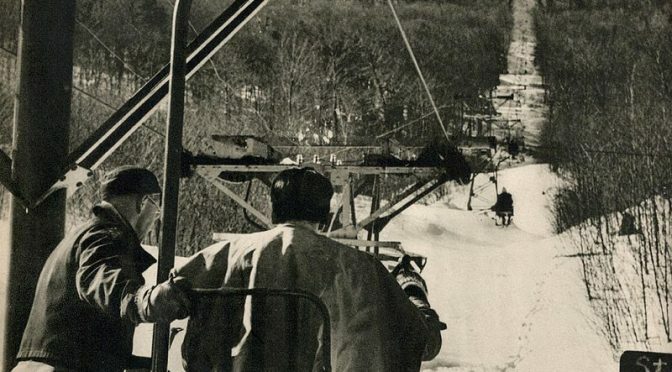 Stowe’s original rope tow was replaced with a new T-bar in 1956 and served beginner skiers for over 25 years at what was Stowe’s primary learning area. This February 7, 2017, Stowe Mountain Resort will celebrate the landmark 80th anniversary of its first ski lift with a $55 lift ticket promotion and an après ski party beginning at 4:30 p.m. The party will be located in the new Canteen Restaurant upstairs in Spruce Peak’s new Adventure Center. Snacks and commemorative items will be provided. The Vermont Ski Museum is also having a raffle to win custom J-Skis, adorned with Stowe’s limited edition Front Four graphics.